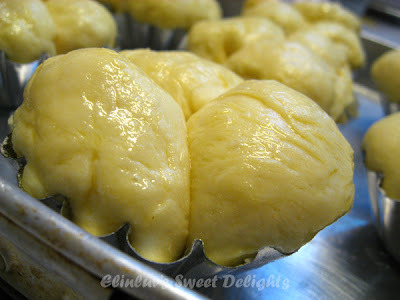 I am always happy when it is FFWD and this recipe is the first for 2012 . Bubble Top Briohes ! 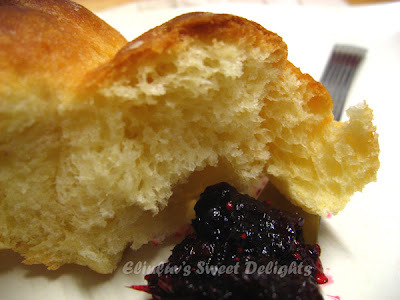 I love bread making and this brioche is a classic. Dorie has it shaped a little different from the traditional topknot brioches. She came up with this bubble top brioche - three little balls of this sophisticated dough, dropped into a mold or muffin tin. They are easy to do and they rise perfectly and bake into beauties. I am glad mine turned out great. You can never go wrong with Dorie's clear instructions . These single-serve brioches are traditionally eaten at breakfast. They are also carrier of choice for smoked salmon and is often served , cut into dippers, or mouillettes , with soft boiled or coddled eggs. We can find lots of ways to use it, including as a starter or Creamy Mushrooms and Eggs. And leftover stale ones can be made into French toast :) but for my household , we finished the lot at one serving :) . The soft springy texture when it is warm makes breakfast heartening. You can zap the leftovers in the microwave for 20 seconds and it is just as good as fresh from the oven. note : Nothing's difficult about making brioche if you have a stand mixer, patience and time and never rush the rising. the dough has to rest a night in the fridge for better texture and flavor :) You can do this in the night and the next morning you can have it baked in time for your breakfast :) That was what I did. The dough is soft and sticky but after a night rest in the fridge, it was more less tacky. It may look difficult but actually it is a cinch to do and I will be making these beauties again for our breakfast. I baked them in fluted muffin molds and they turned out looking great :) Though my round balls may not look nice but after baking them , they turned out looking almost perfect bubble top brioches. I believe that practice makes perfect and I shall do this again to perfect my brioche outlook. The taste is wonderful. I do not need to go Paris or any French boulangeries to savor them...I can now find them in my kitchen. Thanks to Dorie for sharing with us such a wonderful brioche recipe in her book - Around My French Table. Do get one and join FFWD and cook/bake along with us. You can order the book from here ,. It is free shipping around the world. lifting them out of the molds. version of these delectable Bubble Top Brioches ! 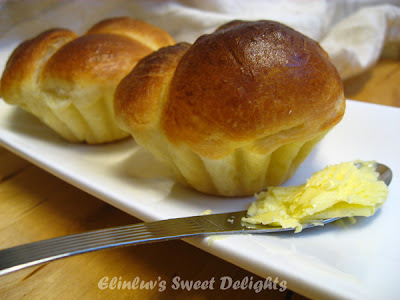 I just love brioche! These look fantastic! 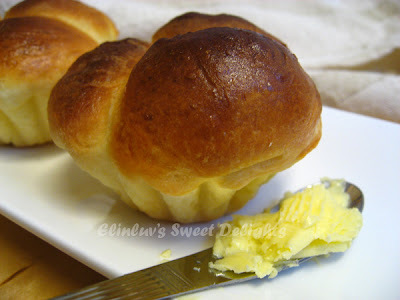 Love your little brioche tins, they worked perfect and your rolls look delicious. Great job! They look sweet with their little fluted bottoms. Very nice! These look great! Love you little molds! Nice molds you used. They look even better. And they look great on the pictures. Your rolls look beautiful! That is so cool that you had individual brioche molds. I was wishing that I had some individual molds when I made these. Yours look delicious! How beautiful your brioche looks! Love the fluted sides made by your molds. Delicious!! Happy Friday! Beautiful! 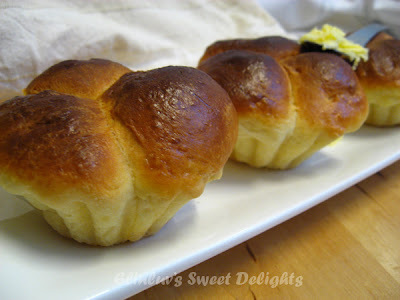 I love the little brioche molds, they really add a nice flare to your rolls;-). I wish I had one for breakfast with a spoonful of jam! Mine is in the fridge = I can't wait to bake them! Have a great weekend! The fluted molds make yours look especially elegant and French. Lovely job on your brioche - I like the little ridges around the edges of your brioche, like cupcakes. These were wonderful, weren't they? I loved this recipe. It was so much fun to make, although the stand mixer is a must. 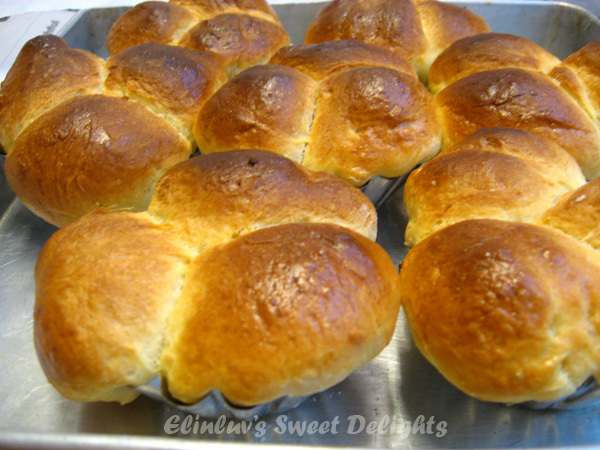 Your rolls look great as baked in the brioche tins. I loved these too. Who needs to go to France? I'm jealous of your fluted molds. I might have to get some of those. Your rolls look delicious! 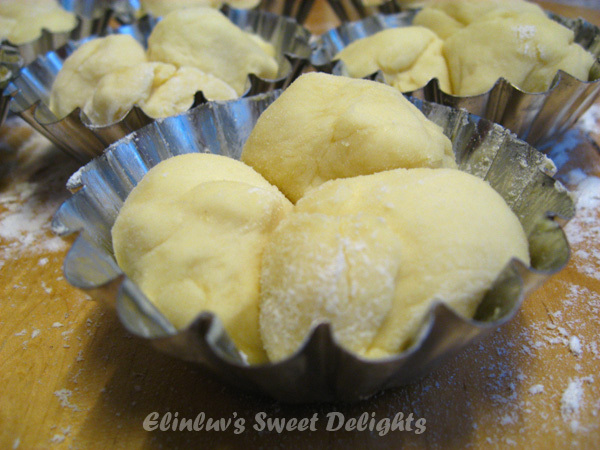 looks like they turned out perfect - love shape the fluted muffin tins give them! They must have been extra delicious with homemade cranberry jam. Yours turned out beautifully! look really cute and good! Just two days ago, we bought some brioche from the B.I.G. and they are dry and not tasty. Yours look so much better and I am sure they tasty far more better than what we bought. they look such a beauty..another great shaping idea! hope you are feeling much better now. The rolls look great in the molds! Elin - your brioche are so pretty. Light, fluffy - wish I had some for breakfast tomorrow! Loved this recipe, it was so easy to make, yet elegant.